Photo courtesy of Rahkia Nance. Rahkia Nance is the digital communications manager for the Water Environment Federation (Alexandria, Va.). 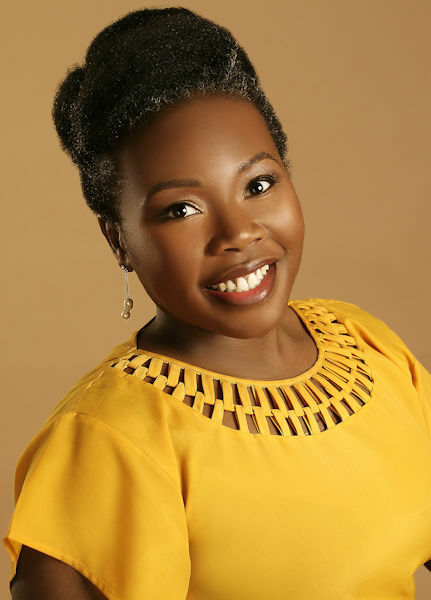 A former newspaper reporter, Nance has a bachelor’s degree in journalism from Florida Agricultural and Mechanical University (Tallahassee) and a master’s degree in strategic communication from American University (Washington, D.C.). When she’s not digitally communicating, Nance can be found either knitting something cozy, baking something delicious, or dancing to her own beat. My relationship with and connection to water is something I hadn’t thought much about until I considered applying for the Water Environment Federation (WEF; Alexandria, Va.) Water Leadership Institute. Then it dawned on me: I come from a long line of environmental stewards. “We just called it common sense,” according to my mom. Y.C. Nance, Rahkia Nance’s grandfather, talks to farmers about irrigation practices. Photo courtesy of Rahkia Nance. My paternal grandfather, Y.C. 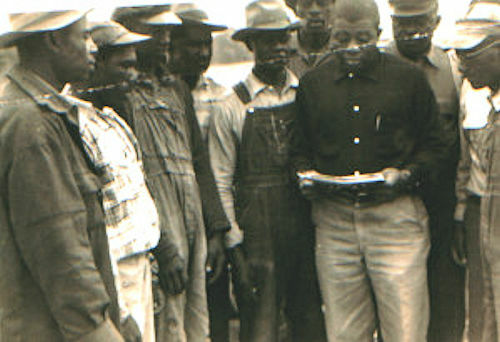 Nance, was an extension service agent in Bullock County, Ala., and taught black farmers how to properly irrigate crops. My great-grandfather, James Evan Nance, maintained a well at his home in Enterprise, Ala. My maternal grandfather, Willie Pinkard, a sharecropper in Stewart County, Ga., knew how to preserve the health of the underground springs, the primary source of water for his community. Tidbits of how to care for the earth and its resources were passed down to me not only by words, but also through actions. Through the examples of role models, protecting and preserving the earth has become automatic for me. Call it habit, duty, or reflex; it’s something that I believe is embedded in my DNA. 1. Expect the best for yourself. I had an idea of the caliber of folks who comprised past Water Leadership Institute cohorts. They are impressive, with all sorts of letters and designations before and after their names. I thought “Rahkia Nance, Renaissance Woman,” might not fit in. But I figured, “Why not apply? The worst that can happen is that they say no.” About 6 weeks after I submitted my application, an email landed in my inbox from the Institute. I quickly scanned the email, noticing the blocks of text on my screen. “Gee, this is a lot of words for a rejection,” I thought. Then, I actually read the words. It was an acceptance letter. 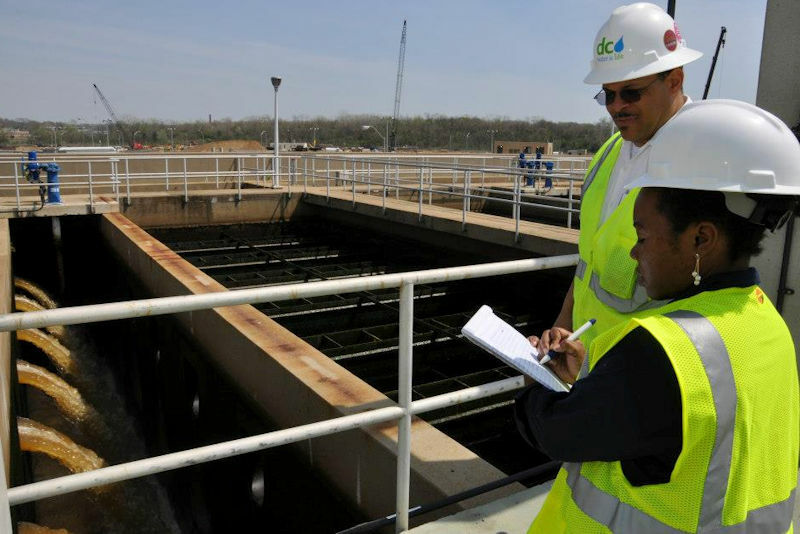 Rahkia Nance interviews a DC Water (Washington, D.C.) foreman at the Blue Plains Advanced Wastewater Treatment Plant. Photo courtesy of Nance. 2. Rise to the occasion, then make it your own. After I realized I had been accepted into the Institute, I thought, “Okay, I’m in. Now what? What impact can I make? How am I needed?” I will always remember a moment during a program discussion about diversity and bias. I talked about being on the receiving end of microaggressions. I shared the “suggestions” I have received under the guise of career advancement tips that really were not-so-subtle hints to assimilate or hide parts of my identity. I do not shrink from who I am, and, as a leader in a sector that is actively trying to diversify its workforce, assimilation would be a disservice. 3. Leave your comfort zone, check your mirrors, and adjust your self-reflection as needed. Despite working in the water sector for 7 years, I always had been hesitant to call myself a water professional. The term seemed reserved for operators, engineers, and scientists — not writers like me, whose strength is turning phrases, not valves. Water professionals, I reasoned, use pumps and pipes; I use pen and paper. But I realized the water sector has room for all of these skills, and its future depends on a workforce with a diverse and varied skillset. 4. “I was rooting for you! We were all rooting for you!” These words, spoken during a rant by supermodel Tyra Banks during an episode of America’s Next Top Model, took on new meaning for me. Participating in the Water Leadership Institute has added to my network of familiar faces to seek out whenever I enter a room. I gained 53 new connections who are my cheerleaders, and whose successes bring me joy. Our cohort was the largest to date, and I’m proud to have made so many wonderful connections. 5. What doesn’t kill you makes you stronger. These words may be cliché, but that doesn’t make them untrue. Leadership is not always going to be comfortable. If it is, you are probably doing it wrong. Public speaking has been my initiation into doing something that is uncomfortable to earn leadership skills. The Water Leadership Institute gave me plenty of opportunities to get it right. Without fail, whenever I speak in front a group, I start shaking and battling what feels like a biblical plague of butterflies in my stomach. Counting down to showtime, I feel like one of three things might happen when I open my mouth to speak: I’ll either pass out, throw up, or push through. Spoiler Alert: I pushed through. 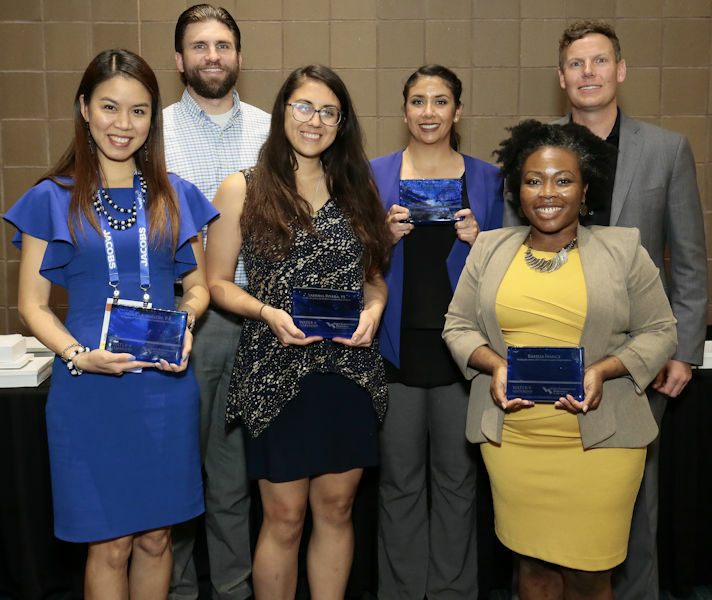 Nance, front right, stands with the other members of her Water Leadership Institute team at their graduation ceremony at WEFTEC 2018. Photo courtesy of Oscar and Associates. The 2018 Institute culminated at WEFTEC® in New Orleans, but that doesn’t mean it ended. In a lot of ways, it’s just begun, and I find myself asking the same questions I did the day I was accepted: Now what? What impact can I make? How am I needed? If you’ve ever asked those questions of yourself, the Water Leadership Institute is a wonderful place to begin finding the answers. You can find out more and apply here.